Today we speak with Jeff Cronenweth, the brilliant cinematographer for some of the most iconic films in cinema’s history including Fight Club, The Girl with the Dragon Tattoo, Social Network and the recent hit Gone Girl. Jeff and I discuss his entire career including his stunning portfolio of music videos and commercials, the pro’s and con’s of digital film-making and working with director David Fincher. 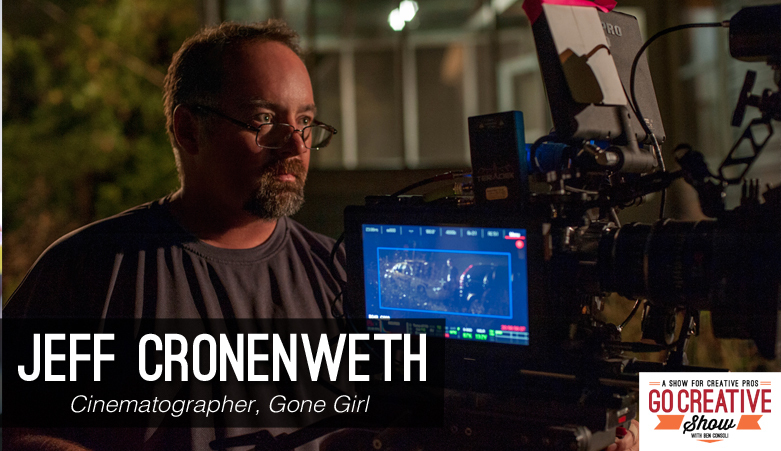 Jeff Cronenweth is truly one of our most brilliant cinematographers creating films like Fight Club, Girl with the Dragon tattoo, The Social Network and Gone Girl. These collaborations with David Fincher have dazzled audiences around the world, received countless awards and changed cinema forever . Jeff’s un-dying thirst for cinematic innovation has made him an advocate for digital film making and inspired his masterful commercial and music video work. And he speaks all about it today on Go Creative Show. Lighting faces to be evil and beautiful at the same time.